Apply for Apna CSC online: CSCs are front-end service delivery points enabled with Information and Communication Technology (ICT) established to deliver essential public utilities and non-government services to the end consumer (which is basically rural population). Apna CSC is a PAN India network that is working to make India a digital nation. Common Service Centre scheme is a scheme under the Digital India Program. It is a significant part of the National e-Governance Plan (NeGP) which was formulated by the Department of Electronics and Information Technology (DEITY), Ministry of Communication and Information Technology, Govt. of India. Apna CSC online is one of the largest government approved online service delivery channels in the world. 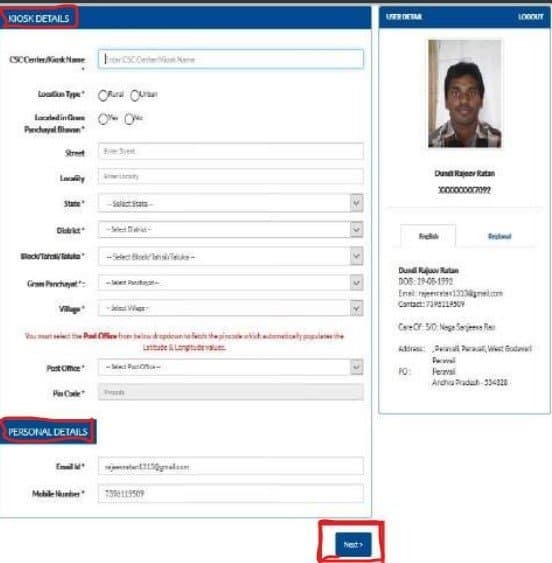 Digital Seva Registration 2019: These CSCs are operating in each state of India and delivering services in the field of health, utility payments, education, agriculture, FMCG products, entertainment, banking, and financial services, B2C services, G2C services etc. 4 How to check CSC application status? CSC registration is done only through online mode. All the applicants are advised to be ready with the scanned copy of all the required documents. Applicants must have a working mobile no and a valid email ID. All the documents must be uploaded in the prescribed format. Therefore, candidates are advised to read all the guidelines and instruction clearly before filling the application form. On the homepage of the portal, applicants have to click on “New VLE registration” or Apply tab. Now applicants have to enter the name, Aadhaar no., authentication type, and have to add the Captcha. After they have to click on “submit” button. 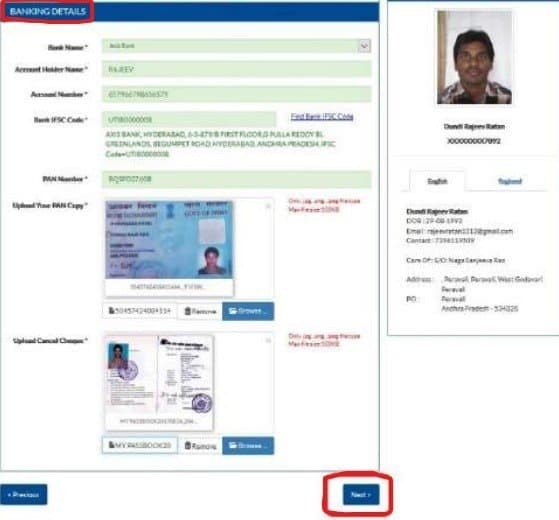 Once authentication is over, applicants are required to fill details under various tabs such as Kiosk, Personal, Residential, Banking, Document and Infrastructure details (as shown in the pictures below). Click on “Kiosk” tab and fill Kiosk and personal details. After filling all the details accurately click on “Next” button. Now fill banking details- In this section applicants also have to upload the scanned copy of PAN card and canceled cheque. Lastly, candidates have to review the application form and have to check all the details again. After reviewing the details they can click on “Confirm & submit” button. After the submission of all the details a reference ID/ application no. will be generated. Once candidates finally submit the application they receive an acknowledgment email regarding the application form on the email ID provided during the registration process. To be a part of CSC, one needs to apply for the same. In order to apply, one needs to register himself or herself in the portal through online mode. Here are some steps CSC registered. After the link is opened, on the link, a person will find “click here for CSC Registration”. The aadhar card number is to be filled in the required box. After having done that, the authentication option can be seen which can be done through IRIS scan, Finger Print Scan or by One Time Password. 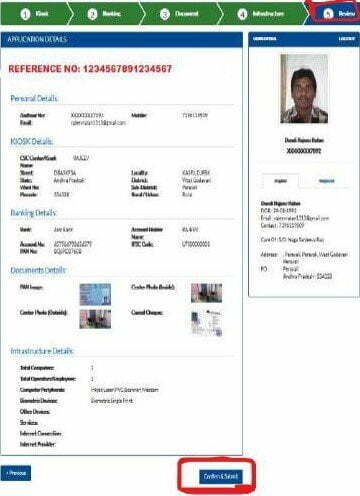 Personal details are to be added. After that, a person needs to upload Geo Tagged images of the centers. Lastly, a person has to click the “submit” option. After having done that, a person has to wait for the result of that or can check CSC registration status online. How to check CSC application status? After completing the CSC registration applicants can check their application status as and when they want with the help of application no. They have to visit the CSC official portal (www.csc.gov.in). On the homepage, they are required to click on “click here to check” link under the option “Account Status”. 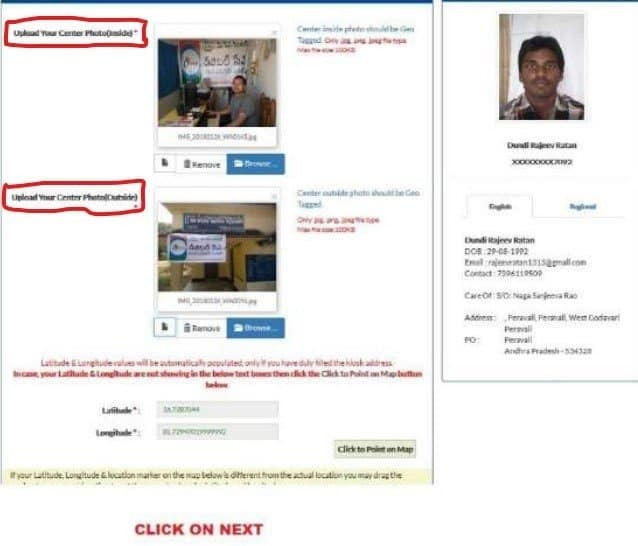 They have to fill all the required details such an Aadhaar No., Name, Authentication type and have to click on Submit button after entering the captcha code. On clicking the submit button, application status will appear on the screen. CSC re-registration is mandatory in all the systems for all VLEs. Every year VLEs have to re-register by visiting the official CSC portal. The re-registration dates are notified to the VLEs through the portal and also through its various social media accounts. Without re-registration, VLE will not be able to do transactions. VLEs are therefore advised re-register within the stipulated time period. For re-registration, VLEs have to visit www.csc.gov.in and have to click on re-register link under the Application tab. After that, they have to provide all the required details and proceed further. Applicants must be eligible enough to apply for CSC registration. They must read the eligibility criteria carefully before registration. Minimum age of applicants must be 18 years. Applicant must have qualified class 10th from a recognized board as a minimum level of educational qualification. Applicant should be village youth above 18 years of age. There is no restriction on gender, anybody who is eligible can apply. VLE should have basic knowledge of computer. Applicants must have fluency in reading and writing local dialect and should have basic knowledge of English. VLE must be motivated enough to serve local people, to disperse their responsibilities with honesty and to be a key driver of social change by delivering CIT enabled services. VLE works at basic level to serve and deliver services to the end consumer. VLE has a great responsibility of bringing change in the society. VLE must have a public place with convenience and safety. Delivery of various services to the end user as the guidelines of Government. Availability of Kiosk to the users from 8:00 am to 8:00 pm. Smooth and effective delivery of services to the users is available on the Digital Seva Portal. CSC full form is Common Service Centre. CSC Centre is a service point/ place from where a VLE operates and serves the end consumer. These CSCs are mostly owned by the VLE. Village Level Entrepreneur (VLE) is a person who works at the village level and delivers all the government and private services to end user through the CSC. What are the benefits of CSC registration? Through registration user can come on board on the Digital Seva Portal after a quality check. Once verification is complete user will be provided an official Digital Seva email Id. Is there any need for training to become a VLE? No training is required to be a VLE. You just need to have the minimum eligibility criteria. However, a good VLE is expected to have respect within the society, entrepreneurial skills, commitment for social service as well as some financial strength. Is there any CSC registration online fee? No, there is not any registration fee for CSC. It is completely free. What is procedure after submission of CSC application and when would the user be able to avail the services of CSC? Application undergoes a quality check process once it is submitted. Once the applications are accepted they further undergo an account creation process and after the creation of an account, credentials are shared with the user through Digimail. What is an Application No.? It is a unique number that is generated after the successful CSC registration. How can I check my CSC application status? CSC application status can be checked by using the application number. Can I apply again if my application is rejected? How VLEs can register complaints? In case VLEs have any issue regarding CSE, they can register complaints through Digital Seva Portal i.e. www.digitalseva.csc.gov.in. Do we need to re-register for CSC each year? Yes, it is mandatory to re-register each year. Though this is an era of technology, still many Indian doubt or do not have any confidence doing transactions through online mode. People still prefer to stand in a long queue for getting their things done. Introducing CSC can really enhance the changes of 100% digitalization. The main objectives for the introduction of CSC are as follows. To access information to remote areas: Indian Government has an objective to make India digital. The Urban areas somehow have picked up on that but for rural areas, it is being a little hard as the information does not get delivered to the remote areas which in turn does not raise people up or they remain unaware of all the policies introduced by the government. With the introduction of CSC, it can be possible to access information all over the nation which would help in the enhancement of the remote people as well. G2C delivery of public services: by the introduction of CSC, the concept of middleman will vanish. Since CSC provides with the government to citizen (G2C), the people who used to get benefit in the middle, will not be benefitted anymore. The services that would be introduced by the Government would be introduced to the citizen directly with full transparency. This can be a good idea for a fair flow of policies. Access to good education or upgradation of skills: since remote areas do not have many schools, even if they have, schools lack proper infrastructure or provide with only basic education. With the introduction of CSC, students living in remote areas could get education through an online mode. They will be getting an opportunity to get an education from top professors and quality education which may not be possible without shifting their place. Introduction of CSC would promote distant education as well so as to make India a nation with the highest rate of literacy. Non-discriminatory access: for rural citizens, non-discriminatory access to e-services has been introduced through CSC. The services provided by CSC are cost-efficient and high-quality videos, data connection and services with voice, medication and entertainment and the private services as well. This service provides remote people with agricultural services like agriculture, horticulture, sericulture, animal husbandry, Veterinary, and fisheries. It offers training services and education such as schools, colleges, vocational education, and employment. It provides health services like health check-ups, telemedicine, and medicines. It provides with banking services and insurance services such as loans, micro-credits and insurance for rural people. To rural areas, entertainment could be introduced in the form of movies and televisions. The payment of bills can be done through online mode. The common service center is a communication and information technology that has been created under the national e-Governance project of the government of India. This project initiated includes the formation of networks of over 100,000 Common Service Centers throughout the country. This program is initiated by the Ministry Of Electronics and IT (MeiTY). The main aim of this project is to provide crucial or vital information and services to the un-served Indians in rural areas. CSC is a web portal which contains crucial information in regards to features of Common Service Center, its eligibility and the qualification which is needed to participate in CSC. This CSC contains details of CSC centers, Details of CSC center holder or VLE that is, Village Level Entrepreneur with valid VLE ids addresses and contact information. This web portal contains all vital information regarding CSC. 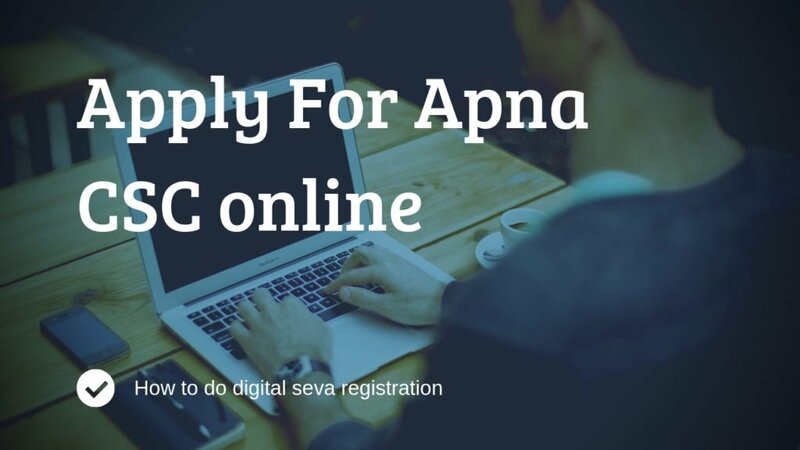 If you find any difficulty in applying for apna CSC online or any issue of digital seva CSC registration can leave a comment and our team will help solving it. SIr csc new registration kab se start honge ?? Abhi date to nhi bata sakte. Jaise hi start hoga hum bata dege. Abhi registration band h. Jaise hi shuru hoga hum yaha informa ker dege. Sir ji good after noon . Sir i want new VLE registration not it is not done it is not open . Please help me. There is problem about registering New CSC VLE Registration. CSC Registration abhi band hai. Jaise hi start hoga hum yaha inform ker dege. New csc Registration kab Start hoga ??????????????????? विषय :- CSC आईडी चालू कराने के बावत! Abhi New registration nhi ho rhe hain. Wait kariye abhi.. So please suggest me, how to I can apply for csc. i m balkrishna ranjan want to applyj csc centre at kharwai badlapur e, my contact no is 9820653170, but due to some proble i m not able to apply. Csc centre at dist Nawada bihar my contact no is 6200946371but due to some problem I am not ablebal to apply. how to apply csc centre. Your account has been suspended because the Bank account holder name on our records is different from the VLE name & KIOSK name associated to your CSC ID. Please check back later on Digital Seva Portal further updates. New VLE registration not working ..
CSC vle new registration nahi ho raha hai plz guide me how can apply new registration …..? Mai registration ka bahut kosish kar raha hoon but nahi ho raha hain. Koi help kar sakta hai. Pls help me. Abhi registration band hai. Kuch time k baad apply kerna aap. New VLE registration not working ….what is the reason behind it…. Muje CSC ID milgaya hai… Par mera DIGIMAIL ID Open nahi horaha hai… Maine Password Bhi Reset kiya hai…. fir bhi Open nahi ho raha hai…. hii bro… when was your csc ID applied ….I was trying to apply for new VLE reistration but it was always busy…not opend the link… do you know which time it was applied… give me suggestion please.. I am trying to Register for Common Service Centre since last week but registration page is not opening neither the toll free number is working. I have tried both several times. Please inform me when the service will resume and why it’s not working now. Is it because of general election? Sir CSC ka registration kb se start hoga . Sir i am a new VLE…. muje kuch pata nahi chalta…. ki muje kya karna chahiye…. sir csc new vle registration kob hoga , main try korke thog geya , 1din mee 1000 bar try korta hu, plz sir jodi o site open kijiye sir, mera education 12 ha,computer shop khula hu, plz sir site open kor dijiye taki hom log ji soku……….! Site open ho rhi h. Please try again. I WANT TO DO REGISTRATION BUT THIS IS NOT SHOWING, WHEN WILL START REGISTRATION. sir i want to serve the people of india , that is my duty . tell me about the how to get csc . how to register as new .? when to apply for csc ? There is a VLE in our villege. Can I open onether CSC in our villege. When I click on new VLE registration it only refresh the page nothing new shows at the screen. Is the govt closed new registration. i have apply but incompleted my form. Mai csc id lena chahata hu. Maine Csc center ke liye date 23/03/2019 ko apply kiya hta abhitak ID password nahi mila hai,kab ID password milega. Sir mera name Aswini Kumar Behera me bhi csc id lena chahatahu mere villege me koi bhi csc senter nhi h . kripa kar ke mujhe id dene ka kast kre ..thank you sir..
sir plss help me registration page is not work. pr muze maharashtra gov ki mahaonline services me kaam kena hai . It’s opening. Please try again. sir mera name shobhit bhati me bhi csc id lena chahatahu mere villege me koi bhi csc senter nhi h . kripa kar ke mujhe id dene ka kast kre ..thank you sir..
is going on csc new registration? I want to new csc. My need a csc certificate.but how to apply.plese…help me.address- vill-jakra,po-Bohar.ps-Memari.Dist-burdwan,pin-713430(westbengle). use same link to apply again, fill detail as per location and provide that center pictures. apply through the link provided above. In case you get any problem then tell us here. HELLO SIR MAI ABHINAV ANAND FROM KORIAPATTI DISTRICT SUPAUL KA NIVASI HU SIR MERA CSC REGISTION NAHI HO RAHA KOI BHI RESKPONCE NAHI MILN RAHA HAI KAYA PROBLEM HAI SB CHIJ TO KR RAHA HU BUT PHIR BHI KYA HOTA HAI SIR…..
hello sir me vinayak gadakari muje csc registeration karna he par nahi ho raha he (Invalid DOB) bol raha he Mera no 6362173987, 8123979661 he Muje contact Kijiye Please Hamare Yaha Ek Bhi CSC nahi he please meri madad kijiye. Apply through the link provided above. What shall I do now to get through. Not clear. Is it for VLE only and enterprise? CAn a senior citizen use it for getting the output of services. what is the process of registration. Then enter the right one. Enter the correct DOB in correct format. I am trying to Apply new register in csc but i am keep getting the invalid dob why? i am trying to register in csc but i am keep getting the invalid dob….. I apply for registration csc but site is not properly open . I want to apply for csc center but site is not working properly. so what will i do?